Final vote planned Dec. 13 on requests by Beaverton, Hillsboro, King City and Wilsonville to provide more land for housing. The Metro Council will proceed with requests by four Portland suburbs to expand the regional urban growth boundary to allow for more housing. The unanimous vote on Sept. 27 sets in motion a process for final approval by Dec. 13 of the requests by Beaverton, Hillsboro, King City and Wilsonville to include 2,181 acres, 1,267 acres of which are considered buildable. The total of potential single-family homes is 9,235. The expansion will be the final one overseen by Tom Hughes, whose second term as Metro Council president will close Jan. 2, three weeks after the council takes a final vote. In contrast with previous ones — including a 2015 process that resulted in no boundary changes at all — Hughes said, "This has been the most tension-free (process), because we have talked to each other about important stuff and what is going to happen on the ground." But Hughes — a former Hillsboro planning commissioner, city councilor and mayor before his election as Metro president in 2010 — said exclusive zoning for single-family homes will be a thing of the past for undeveloped lands. "I think it is time that we urge our colleagues (in cities and counties) to move in the direction of designing a system that includes a mixture of housing types," Hughes said. "We will all be better off in serving our community." 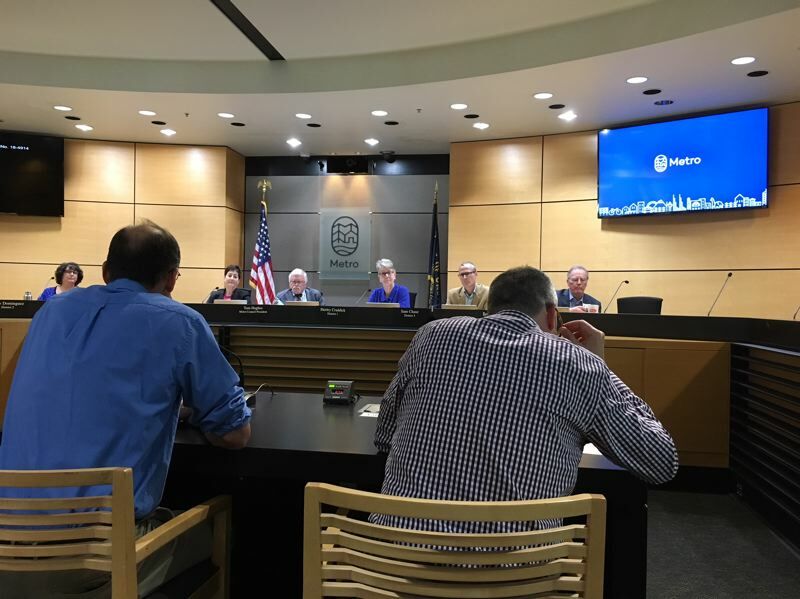 Metro Councilor Craig Dirksen of Tigard said council action is intended to meet state planning requirements that ensure a 20-year supply of buildable land within the urban growth boundaries of cities. "It has resulted in greater collaboration with our governments and much greater satisfaction" from cities and other participants, said Dirksen, a former Tigard mayor. "We reserve the right to improve our process. But I think this has been a huge step in the right direction." Still, the expansion requests drew criticism from 1000 Friends of Oregon, a land-use watchdog group that seeks legally enforceable conditions on the cities. Deputy Director Mary Kyle McCurdy said the cities should show how they will take steps toward promoting more diverse housing and complying with a 2017 state law that requires cities to accommodate accessory dwelling units (ADUs), known as "granny flats," on already-occupied lots. She said the single-family housing that is dominant in the cities' plans is "economically exclusionary" to low-income households and people of color. "There is no explanation, nor can there really be in this day and age, for how perpetuating segregated exclusionary areas for single-family housing meets Metro code requirements for an equitable and efficient distribution of housing," McCurdy said. Responding to a question by Metro Councilor Bob Stacey about whether the council should impose requirements, she replied: "I wish I could rely on the expectations and goodwill partnerships with the cities. But the fact is that you have had that ADU code requirement on the books since 1997 and none of them is in compliance." Metro Councilor Sam Chase, whose district straddles Multnomah and Washington counties, said that Metro policies should promote diverse forms of housing, but single-family homes "is a choice that should be allowed." Two other witnesses took aim at Beaverton's request, the largest of the four, for inclusion of 1,232 acres and up to 3,760 new homes in the South Cooper Mountain urban reserve. Raymond Eck, who sits on Washington County's Community Participation Organization 6 for the Aloha area, said the Metro Council should grant only part of Beaverton's request and require city officials to return in 2021 at the next regular consideration of boundary changes. "The public road system on Cooper Mountain cannot support the extra traffic that will be coming with this new additional housing," he said. "It's not going to handle the traffic when Cooper Mountain South is completed with the addition of Mountainside High School. "Beaverton is sure not going to pay for it," he added. "It's not within their city limits." Michael Donoghue said he already lives within the current urban growth boundary, but spoke for the 175th Avenue Neighborhood Association that opposed the expansion on similar grounds. "Our consensus is that Beaverton's concept plan proposes to do too much, too fast, at the expanse of current and future residents' quality of life," he said. "Most of us believe that the concept of an urban growth boundary is a good one. We feel it has done great things for Oregon. But in this case, we feel the planners will need to take this slower and reduce their targets to allow the transportation infrastructure to catch up with the high-growth communities already in progress to the south of us." But the expansion proposals had their supporters. Paul Grove spoke for the Portland Metropolitan Home Builders Association, which supports all four proposals and a new look at the process based on revised 2040 projections. "There is no better investment than the investment already on the ground," he said. Vasilios Garyfallou said his property will be surrounded on three sides by the urban growth boundary. But he supports Beaverton's current request. "Responsible expansion of the urban growth boundary along pre-existing high-density developments within the city limits of Beaverton is the most reasonable method by which city planners can meet the growing demands of equitable housing and job-creating development projects," he said. During an initial hearing Sept. 20, planners from Beaverton and King City supported their city's proposals. "We clearly understand what they want in this next expansion," Beaverton Mayor Denny Doyle said in August, just before Chief Operating Officer Martha Bennett made her recommendation to the Metro Council. "We talked with them and they seem to be satisfied. I am very confident they are going to say yes." • Beaverton: Cooper Mountain, 1,232 acres total, 600 acres buildable, 3,760 homes. • Hillsboro: Witch Hazel Village South, 150 acres total, 75 acres buildable, 850 homes. • King City: Beef Bend South, 528 acres total, 400 acres buildable, 3,300 homes. • Wilsonville: Frog Pond, 271 acres total, 192 acres buildable, 1,325 homes.